A roll of 8 eco-friendly refuse sacks made with minimum 50% post-consumer recycled plastic. The Suma Recycled Refuse Sacks - 90L - Pack of 8 product ethics are indicated below. To learn more about these product ethics and to see related products, follow the links below. Products used in my business and itâ€™s good for our customers to see we are thinking about our environment. 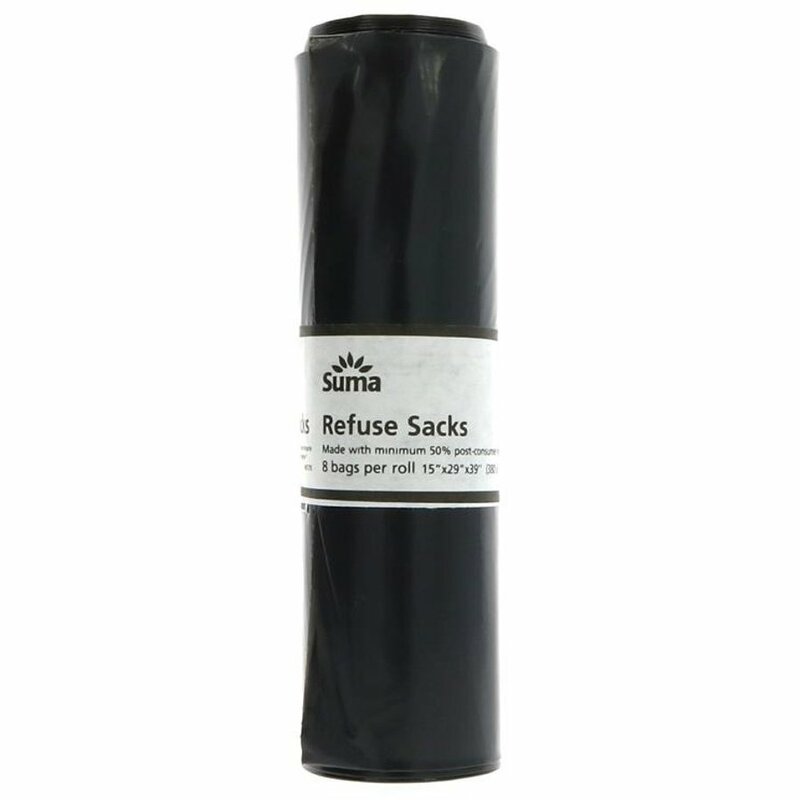 There are currently no questions to display about Suma Recycled Refuse Sacks - 90L - Pack of 8. Suma is the UK’s largest independent wholefood distributor. It specialises in vegetarian , fairly traded, organic, ethical and natural products. Now under its own brand it also has a wide range of food and non-food products. Taking an ethical approach runs to very heart of what Suma is about. For foods, this means that you can expect great taste and value plus an ethical approach in every decision. For example, products containing eggs use free-range eggs; organic and speciality-diet alternatives are stocked whenever possible; and vegetarian really means vegetarian, with no animal or fish derivatives used in production. Non-food products are subject to the same strict conditions, so our cosmetics and household products must be cruelty-free and environmentally friendly. Why not try vegan beans and sausages from Suma?